Not for use with the sintered bearing (it's too thick) Use a thinner oil. 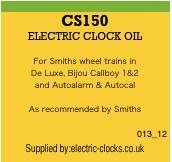 After much searching electric-clocks.co.uk has managed to source the very orignal CS150 oil that was originally specified by Smith's for use in their clocks. Each bottle will be provided with a Smith's oiling chart.